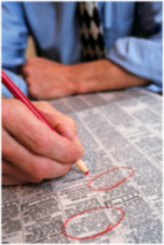 The U.S. Bureau of Labor Statistics says February unemployment checks in at 8.1 percent. That would be 651,000 jobs in the tank. Ouch. Breath in . . . . . breath out . . . . This is mind numbing news. The kind of news when you just sit there in front of the tube in utter disbelief, kind of trying to drink in the impact of the news. What have we done to ourselves? While this is hardly a 9/11, I can’t remember being immobilized in front of the TV at any point since 9/11. On that fateful day, I sat in front of the TV in utter disbelief. I didn’t call in to say I would be late to work. I didn’t worry about what kind of reception I would get when I got there. I staggered in at about 10:00 a.m. that morning and the office was deserted. The only people there were sitting in front of their computers crying. Again, 8.1% unemployment is no 9/11 but it is the kind of news that said things are going to be very different from now on. As a mentor to job seekers my job is to put this news in perspective. There are less openings to go around, but there are still lots of openings. You cannot allow this to escape you. An 8.1% unemployment rate is not going to bring this economy to a halt. I’m not going to get all technical on you, but full employment is roughly around 4%. Full employment means that there would be 4 out of every 100 people looking for a job even if the economy was running at full throttle. So now we have a little more than 8 people out of a 100 looking for a job. This means if 92 people out of 100 are working, then there are 92 jobs that need to get done. This is 92 jobs that companies will pay people to do and your job is to find one or get the company to create it on your behalf because you are so good at what you do. Again, 92 out of every 100 people have jobs that are worth being paid for. Sophomore level economics states that price is the equilibrium point where supply equals demand. Since there is a high supply of people looking for a job, prepare to take a good deal less than what you would normally accept. Its a downer, but it is a stark reality of the economy. Again, bite the bullet. To illustrate, remember when you didn’t sell any stock two months ago because the price was too low? What is the value of those stocks now? Again, take it on the chin. Accept the lesser income and you will be glad you did. If you could have got more, you can take that up with your boss once you start adding value. Take the gloves off. In a particularly competitive job market you need to milk every advantage you can get. It does not matter if someone is better trained or has better experience than you do. This is a stark reality of the job market. Your ability to sell yourself as the person the company needs the most is the sole determinant of who gets the job. If you can morph your experience on your resume more easily than the next guy – more power to you. If you have a tool that tracks your job search activity in the background while you focus on your job search that is a feather in your cap. If you are able to employ a resource that allows you to reach wider and dig deeper than you have an advantage and nobody would knock you for leveraging that advantage. Look at some of these solutions and see if you can find one you can use. In closing, once you get over the jolt it is time to roll up your sleeves and get on with the business of life. I welcome your comments below and encourage a dialog on this very alarming news.